Our main characters are actually more important than our plot, so I'll introduce them first (it's always interesting comparing character versus plot driven novels). Now, none of them are actually called elves or faeries or anything, though the less human looking characters have names. But they've got magical abilities and severe iron allergies. Kara is our main character, and the Guardian. She's responsible and sensible and dedicated to her princess, and honestly, a much better person all around. She's the girl who lets her friend in at 3am in the morning, tries to talk her out of parties, and provides a shoulder to cry on. She's always loved and looked out for Dylan, and never really knew why. She has some magic in her own right, but it's amplified by the Guardian bond. Dylan is the princess of the Daylands, basically the elf/magical good guy kingdom of light. Sent away for her own protection as a child, she's very powerful and a complete mess. Living in the mundane human world messed her up big time, and she's spent most of her early life drunk, partying, addicted to drugs and sleeping with the wrong guys. In the first book, she got the chance to metaphorically sober up by returning to the magical realms, stepped up to the challenge of leadership and finally admitted that she loved Kara back. Aside from that, we have the bad guy, who was the quiet lurking advisor in the previous book, who's found himself an overpowered and pretty front guy to play ruler. And we have an assortment of magical beings helping our heroes. Some are new, some are survivors from the first book (some died), and they all more or less know each other. This is as much a story about their relationship as it is about magic and kingdoms. If you put them in another book, with no fairies or dreamwalking or magical bonds, it would still work. It would even play out the same way. Much like book one, this is also a story about addiction and mental issues, codependence, growing up, letting go, and the pain of watching loved ones throw themselves into drugs and claw their way back out, over and over. Added to that is the extra layer of maturity, decision making and trust, of two teenagers forced to grow up too fast, who have to decide if various adults are worth trusting or not. The main action in this story is because of the bad guy's attempt to take over the other realms. Killing or corrupting the Princess of the Daylands is a pretty major arrow in his evil plan quiver. The Daylands are under siege and most of the action takes place back in the city in Inbetween. The beginning is set in the real, mundane world. It's some months after the first book and they've spent the whole time on the run. Needless to say, this is stressing them out. They're hunted and edgy and their relationship has blossomed and is breaking. The fragility of it, as Dylan/Morning pulls away and flinches from onlookers, over kisses and touching and holding hands, hurts the reader along with Kara. It also perfectly shows the difficulty of being in a relationship where you fear being 'out', and there are always looming social repercussions. With new information, and with Dylan increasingly falling apart in the mundane world, they give up and return to the world of faery. There, they join up with co-conspirators and attempt to take out their enemies head on, as they have no real chance of dodging them for the rest of their lives. And all this time, Dylan is having paranoid and miserable dreams about Kara abandoning her. Mostly for boys. They're basically walking into a trap, but have just enough of an edge, courtesy of a complicated polymorph type potion (which gives the girls a chance to engage in some thrilling underground adventure, powerful magic and bonding time while they hunt for ingredients), that they actually have a chance of success. Unfortunately, Dylan is so fragile and bitter and paranoid, that she's easy to manipulate and suddenly, things start going wrong. The whole time, they're hunted and in hiding, forced into close proximity with a bunch of helpful strangers, and trapped by terrible choices. This places ongoing stress on their relationship, and Kara is increasingly placed back into the position of 'managing' Dylan. At the end, Kara gets to just look at Dylan and realise that she can't and won't be helped. If someone's that insecure and selfish and broken and miserable, and insists on pushing you out, there's not much you can do. And hanging around waiting on that one tiny maybe will destroy you before it helps them. It's a bit skimpy on the recappable plot point side, so I'm trying to avoid spoilering it. The main action isn't the real story anyway, as I've mentioned. It's the war that they don't know that they're fighting, the tensions in the girls' relationship, and Dylan's paranoia and fragmenting, as she rejects Kara and starts giving up on fighting her addictions. That's not to say that the story is skimpy, just that there isn't much to analyse there. Stuff happens. Monsters attack. The good guys succeed in some things, and then find out they should have been worrying about other things. It all ends with a magical showdown, and a cliff hanger, setting the scene for the second book. Nothing specific that I noticed; probably a typo or two. The plot itself could be stronger, especially as it's one story broken into three parts, but the other way around would be worse. Morning is Dylan's 'real' name, and the titles are actually quite literal: she rises to the challenge and her power, she falls into darkness, she... something unknown for the third book. And the series is named after Kara, the Guardian of Morning. I know that this is screamingly obvious, but I had this mental blind spot about it for ages, and suddenly went OH, as I was writing this. So I figured that I should point it out. I was an early beta reader for this book, and I'm blown away by how much it has improved since then. I went back and looked at all my suggestions and the author had fixed everything I mentioned. I had to put a bit of space between my reading it and the review, because I kept remembering the early version a bit too strongly and kept wanting to start comparing things. I definitely do not claim any credit, as they had multiple beta readers, and put a lot more work into the story after I saw it; I'm mostly trying to explain some of the difficulty and bias that I may have reviewing this. Also, it makes it harder for me spot issues, as most of the ones I would notice are ones I've already pointed out and have been changed. A strong young adult fantasy about a very dysfunctional relationship. While the fantasy aspect is fun, it's mostly just the metaphoric coating for the real story. The main characters are well written and identifiable, and it's a fun read in it's own right, as well as being a good 'issue' book for relationship issues, maturity and addiction. 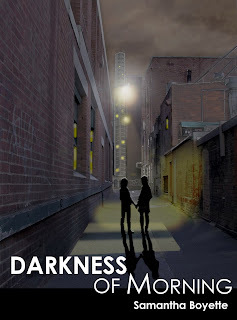 You can buy Darkness of Morning as both paperback and kindle ebook. I get that the author wanted to make her like that, she just pushed my buttons the wrong way although I did like her for half of the book. I still think this is an innovative book and plot though.